Yesterday, we showed you the no-gimmicks 2014 Chevrolet Camaro Z/28 attack the infamous Green Hell in a supercar rivaling time of 7:37:40. Now have a look as Automobile Magazine demonstrates the “No-Lift-Shift” capabilities of the refreshed 2014 Camaro ZL1. 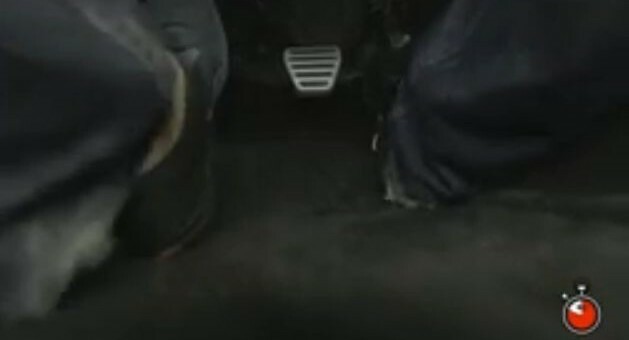 “No-Lift-Shift” allows you to keep your foot firmly matted to the accelerator pedal while you up shift. When coupled with the launch control system, the mighty Camaro ZL1 becomes a deadly weapon on the drag strip. A computer program stops the ignition to prevent the needle from bouncing off the redline during No-Lift shifting, while the supercharger keeps spinning between shifts to deliver optimal boost when entering the next gear. So you’re at the drag strip, you dump the clutch, and as the supercharged LSA V8 inches closer to the redline, instead of letting off the gas, depressing the clutch, shifting gears and getting back on the gas as quickly as possible — you leave your foot pressed hard down on the accelerator as you change gears. Sounds like you’re going to leave bits of your drivetrain all over the road, right? See for yourself in the video below. Check your device – I got all three vids on my Galaxy SIII. First Chevy application for this tech was the Cobalt SS I believe. It was in the Cobalt and it also was used in the HHR SS and Solstice/Sky cars with the GM Turbo upgrade. It is something that takes getting used to as it just does not seem right and you think you are going to mess something up. It is fun and there has been debates if it is or is not faster to use it. It does keep the Turbo spooled up in the Eco engine cars but on the ZL1 it is not as much a factor. In many cases anymore the Auto Camaro’s have proven to be faster even with a little less power than the Standards. That is based on GM numbers from a year or so ago. If you have the chance drive one of these and try it as it is slick. Now I have driven some race cars where you could do this with out computers but you have to get it right. But they were built to do it and were pretty bullet proof. Amazing…………………..that 50 years ago when I shifted my 409 without lifting, I shouldn’t have been doing that. Or was it just Camaros that you couldn’t do that? I do have to confess though, that when I had to replace the main drive gear and the counter shaft in my BW T-10, I had second thoughts………….for about 2 minutes. What good is showing a dragstrip run without the e/t? I estimate he did it in about 13.0 sec. Wow I do this in just about every RWD manual transmission I have ever driven. Mostly trucks, f150s, silverados, Jeep wranglers, BMW’s etc… I guess this is just a safer way to do it? I don’t know about “shouldn’t have been doing that” when it comes to old school “speed/power shifting”. All it says to me is you took the time to become highly proficient at performance driving. Something modern “performance enthusiast” sometimes appear loathe to do. I practiced speed shifting every manual car I ever owned, well except for my 05 GTO – the hydraulic clutch is just too weird feeling and slow to release for my feet…but boy did I try. Now that I think about it, even without this feature, you’d be hard pressed to do any damage power shifting a modern car anyway – thanks rev limiters! That Camaro is a beast! Is this something new on the 2014? What happens when you do this on previous year models?